New for 2019, the visually stunning Dynamo Ergo chair provides new levels of comfort and support that suit the ergonomic needs of each individual user. The foundation of the Dynamo Ergo chair is the robust chrome frame and base which adds immense strength, complemented with a breathable mesh or luxurious bonded leather seat and back (with optional headrest) for an exquisite seating experience. The little brother of the Dynamo Ergo is the Dynamo chair, with the same split backrest design and auto adjusting lumbar support. Dynamo has been designed for the modern, hard-working office environment where ergonomic, mesh back posture seating is combined with contemporary styling, an airmax seat and a choice of a black or white frame for an exciting seating experience. 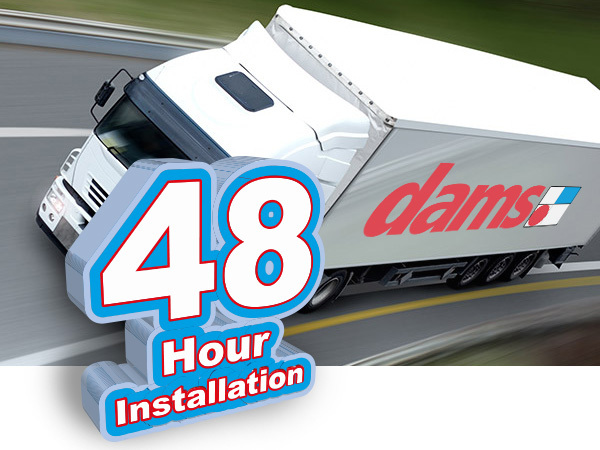 Dams now offer one of the largest seating ranges in the UK. New for 2019 seating families include Dynamo, Solus, Lola, Lennon, Santana, Strut and Ronan, which all have sleek, modern designs and multiple features and allow the user to enjoy the modern design without compromising on good ergonomic support. Many employers are now providing workers with height adjustable desks, allowing workers to alternate between sitting and standing throughout the day. The Elev8² range is the ideal solution to address the issue of employees who have a sedentary desk job who do not spend enough time standing during the working day. But being active at work doesn’t just have to be limited to your desk! New for 2019, Dams have developed the Elev8² Touch range using the same twin electric motors and three part leg columns to launch a new range of height adjustable modular boardroom tables. The new Elev8² boardroom tables combine unique design with versatility to transform corporate spaces like boardrooms into flexible meeting places, so users can vary their position from sitting to standing allowing for a variety of postures throughout the meeting. That's the 2019 Dams Furniture Guide is here - 464 pages packed with the biggest and best portfolio of office furniture products in the UK. Based on the company’s hard-earned reputation for design, quality and value - offices large and small, dining areas, receptions, breakout zones and home offices are all catered for with an eclectic mix of products covering contemporary and traditional styles. Dams have launched a new corporate logo, marking the most dramatic change in our visual identity since the 1980s. Designed in-house, the new visual identity presents Dams as a modern and evolving company, using an updated version of the company’s iconic red and blue Mondrian mark for a new look and feel that reflects the strength and direction of the business heading into 2019. "Our new logo better communicates what Dams stands for today," said Chris Scott, Managing Director. "We've kept visual elements that reflect our heritage but we emphasised our forward-thinking mindset and objective to achieve strong growth, drive innovation and focus on servicing the needs of our customers." We’re delighted to have been nominated for not 1, not 2, but 3 awards in 2018. We’re up for the Manufacturer of the Year Award at the Knowsley Business Awards which has become an established date in the business and social calendars, attracting guests from across the North West. Dams have also been shortlisted for the Publication of the Year prize at the Boss Federation Awards for our 2018 Furniture Guide. And last but not least, we also have a chance of picking up another Manufacturer of the Year Award for our Social Spaces portfolio at the Mixology North awards which is the most prestigious, highly anticipated award ceremony and winter ball in the North, created for the dynamic and innovative interior design community. Fingers crossed for the Dams team at the awards nights! We’ve opened our new, multi-million-pound manufacturing facility at our head office site in Knowsley, Merseyside. The new 85,000 sq. ft (7,900 sq. m) building consolidates the four sites that Dams currently operate from on Knowsley Industrial Park into one larger site which will bring all their manufacturing and assembly together on one full site alongside their head office, showroom, warehouse and distribution centre. And no brand new, state of the art UK manufacturing facility is complete without a 'hub' area for Dams employees to enjoy on break times with Foosball and PingPong tables, outdoor dining facilities, and the iconic red British phone box to make any personal calls. For a tour of the new operation facilities and product showroom, feel free to book an appointment with one of the Dams sales team today! Our MyDams customer portal has been developed to bring all your product details, images, stock information, customised promotion flyers and sales quotes together into a single place that’s easy to manage. And just in case you hadn’t already noticed – MyDams has had a bit of a makeover in the last week with a clean, responsive design bringing a new look and feel to the customer portal. If you don’t already have a MyDams login, then you’re missing out on some market-leading sales and marketing support. New for October is MyDetails where you can manage your account information quickly and easily, in addition to viewing your main contacts here at Dams. If you don’t already have a MyDams login, creating your free account is quick and easy - you might just be surprised! Our highly adaptable meeting room tables are an excellent choice for conference, office, meeting and training facilities with the ability to quickly and easily configure a room and to meet the demands of any user group. Meeting tables are designed to help you work efficiently, with arrangements that are quick and easy to setup or reconfigure when needs change and to support any number of people or type of work. New for September 2018 are curved folding leg tables, which combine stylish good looks with versatility and can be used stand-alone or together with the trapezoidal and semi-circular tables to create your desired layout. A click button mechanism on the underside of the table means the folding frame, available in different finish options, can be folded neatly within the footprint of the table top, offering easy manoeuvrability and convenient storage. It’s that time of year again. We’re currently working on the 2019 furniture guide and once again we are offering the opportunity for you to order catalogue overprints personalised with your company logo and contact details on the front and back cover. With a choice of 6 catalogue cover design options and with prices from as low as £1 per catalogue (prices depend on quantity ordered), this is an opportunity you don’t want to miss out on. The new Dams product catalogue will be bigger and better than ever, featuring a comprehensive product range of over 6,500 products which offer a one stop solution for all your office furniture needs. The new 2019 furniture guide will be around 100 pages larger than the current 2018 catalogue, so there are a lot more products going in next year’s catalogue including the recently launched tables, new seating ranges, and much more. We’ve extended our range of boardroom tables, meeting room tables and café/dining tables – with over 1,700 SKU’s alone now available across the table’s product portfolio and there are 3 stunning, new brochures available to showcase the new table ranges. For a copy of the new Dams Tables brochures, contact the Dams sales team today! New for August is Eternal –a sophisticated boardroom table collection with robust customisable options for all your meeting room needs. Many sizes, shapes, and details let you tailor the look for formal or casual settings, with stylish flat circular bases and cylindrical columns, tops available in five finishes, and integrated power options which makes Eternal a practical choice for supporting technology. The Cooper seating family (the latest addition to our Social Spaces™ portfolio) is what every good business needs, understated style and durability. Visually these pieces seem familiar, almost vintage, but with important original features including clean and confident lines defining the wooden frames and the deep, inviting form of the cushioned seats. Designer Martin Vicker, working in collaboration with the Dams design team, has created a classic soft seating collection that offers an exceptional level of comfort and are smartly sized to make a big impression, even in small spaces. Wooden frames are available in natural oak, white or black finishes and the range includes a matching coffee table which also combines intelligent design with the finest craftsmanship. There have been a few updates to the MyDams customer portal which have gone live in the last few months. The new ‘Downloads’ section allows users to download files quickly and easily, including CAD models, product images, company literature, policy documents, website product data files, order forms, promotions, and much more. If you don’t already have a MyDams login, creating your free account is quick and easy. On the individual product pages in the product library there’s now a feature to create a single page pdf product data sheet for all products – including images, product features, dimensions and specifications. And you can personalise the product data sheets with your logo and company details using your saved banner header – all with just the click of a button! To celebrate our 50th anniversary in 2017, we set ourselves a challenge to raise a whopping £50,000 for charity over 12 months. Dams not only smashed through our £50,000 target but managed to raise a grand total of £61,336 for their chosen charities – Alder Hey Children’s Hospital and the British Heart Foundation – which will make a big difference to people's lives. The Dams £50K for 50 years charity challenge aim was to inspire and encourage Dams employees, both as individuals and as teams. Fundraising activities across the year included - sporting events and challenges, raffles, bake sales, shop donations and much more. Members of the Dams charity committee presented BHF and Alder Hey with their monster cheques this week. Dams are proud supporters of the Nemo dealer group and we’re delighted to have won the prestigious Vendor of the Year award for the 5th time in 6 years! We were present at the annual Nemo conference to showcase our new 2018-19 product portfolio including our Figaro designer lounge chairs, our Crew table and chairs, and the new Reed, Jovi and Solus operator chairs – all with the music festival conference theme. Matt Aldcroft, Dams Sales Director, picked up the top award at the Nemo Refresh ’18 conference hosted at the Forest Pines Hotel & Golf Resort in Lincolnshire on the 15-16 June. The Vendor of the Year award, which is voted for by Nemo dealers, recognises Dams extensive UK manufacturing operations and the hard work of Dams employees across all departments of the business. We’ve extended our range of Crew multi-purpose tables and seating options from the Social Spaces portfolio to now include solid wood frames stained in a choice of 3 colours – black, white and oak. The Crew table and bench combination provides the perfect answer for a less corporate modern office and promotes a more social aspect to the working day. Table tops are available in a choice of laminate finishes for a personalised touch in any workplace. With its simplicity of form, combined with modern connectivity points, Crew tables provide a more modern, intelligent approach to table solutions that provide teams with the tools they need to work together without disconnecting them from their environment, while at the same time having a space for those impromptu, informal meetings, and a place for dining and socialising. Visitors to the Project Area at Clerkenwell Design Week were the first to see our latest Social Spaces furniture products designed to transform the office environment. CDW 2018 saw the launch of Kastaway, a creative design collaboration between Dams and International award winning Designer David Fox, with modern looking soft seating incorporating softer and more homely ribbed details, together with the traditional Dams skillset of wooden tables and desks to create the complete contemporary working environment. But that’s not the only new product range we launched at CDW. The Cooper seating family is also new to the Social Spaces portfolio. The 1, 2 & 3 seater options are designed to make a big impression, even in small spaces, but the single rocker is the real character in the family, offering a nostalgic charm and is a must sit‐in chair. As our business grows rapidly we will continue to invest in the best equipment available to support our market-leading position, and over the last 2 months we have taken delivery of not 1, not 2, but 3 new machines in our wood factory. With the growing demand for shaped wooden furniture, we’ve invested in a new, state-of-the-art Rover K Smart CNC machine to help develop our ‘Shaping Centre’ which has already significantly improved manufacturing times. The Active Trim 120 edging and trimming machine works straight and shaped panels for the application of flat edge-banding material in rolls, allowing us to be more efficient with shaped products. And last but not least there’s the Skipper 130A double-head drilling machine which can machine all 6 panel faces simultaneously in one single step. A team of 12 intrepid adventurers from Dams recently completed the national 3 peaks challenge in under 24 hours. The challenge consisted of scaling the 3 highest peaks in Scotland, England and Wales – which are Ben Nevis, Scafell Pike and Snowdon respectively, with all proceeds and donations going towards our target of raising £50,000 in 2017-18 for Dams chosen charities Alder Hey Children’s Charity & the British Heart Foundation. The challenge time of 24 hours not only involved scaling all 3 peaks, but also the transport times between them, so a group of Dams employees were also undertaking the driving and providing logistical support. The 3 peaks challenge requires a good level of fitness, determination and stamina to complete within the 24 hours. Sleep deprivation also plays a key part in making this a tough challenge, as well as the ability to scale the peaks. There have been a few updates to the MyDams customer portal which have gone live over the last quarter. The new ‘Downloads’ section allows users to download files quickly and easily, including CAD models, product images, company literature, policy documents, website data files, Social Spaces order forms, current promotions, company newsletters, and much more! Our MyQuotes easy-to-use quote system now has an export to Microsoft Excel option where users can export the same quote details to an editable Excel file. Users now also have the option to add multiple sections to a quote which you can name and edit. If you don’t already have a MyDams login, creating your free account is quick and easy at www.dams.com. The most important thing to remember when selecting an office chair is that people come in all shapes and sizes, so there is no ‘one size fits all’ office chair that will suit everybody. The new Jovi and Reed chairs from Dams offer users the movement and positioning capabilities that enable them to sit comfortably, combining the right ergonomic design with exceptional customised support. Jovi is a next generation office chair with a free floating back that provides the exact amount of back support customised for each individual user and with no manual controls to adjust. The visually stunning Reed chair provides new levels of comfort and support that suits the ergonomic needs of each individual user, with a stylish frame available in black or white with matching lumbar lines and a free-floating mesh back. Dams are excited to be exhibiting at Clerkenwell Design Week for the very first time so we can showcase our latest Social Spaces™ furniture designs for breakout areas and interiors within commercial environments, designed and manufactured in the UK by Dams. Be sure to come and visit us in the Project area at Clerkenwell Design from the 22nd to 24th May. CDW 2018 will see the launch of a new, modular based landscape furniture range designed to transform the working environment into a modern, multi-functional workspace with furniture solutions that encourage agile working and progressive work practices. The Kastaway Collection is the result of a creative design collaboration between Dams and International award winning Designer David Fox. The next generation of Elev8² sit-stand desks from Dams are available as single desks, back-to-back desks and as a bench desk system, to upgrade and cater for all types of office layouts. Elev8² sit-stand desks are now available in twin motor (Elev8² Touch) and single motor (Elev8² Mono) variants, providing affordable features and durable design to transform the workplace with healthy flexibility and mass appeal. The Elev8² desking range provides the ideal solution to address the issue of employees who have a sedentary desk job who do not spend enough time standing during the working day. 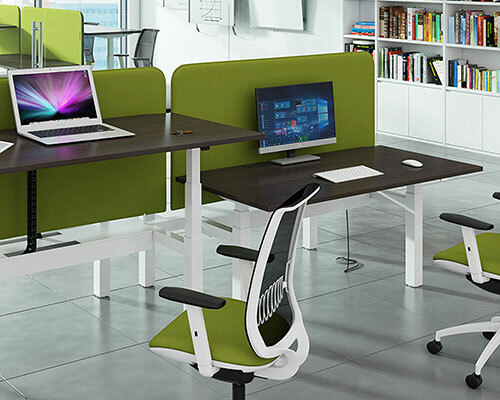 In addition to the numerous health benefits provided by periodic standing, studies show that height adjustable desks promote creativity, team interaction, collaboration, and the willingness to share ideas. Work has officially begun on a new multi-million pound manufacturing facility at our head office site in Knowsley, Merseyside. The 85,000 sq ft (7,900 sq m) building is due to open in late 2018, consolidating the 4 sites that we currently operate from on Knowsley Industrial Park into one larger site to improve operational efficiencies and boost our UK manufacturing capabilities. This investment in UK manufacturing will also ensure that we can reduce lead times on our expanding portfolio of made-to-order products. Manufacturing in the UK also means that we are protecting and developing the skills needed for the office furniture industry of the future, ensuring that we create a legacy of quality British-made products that are fully traceable and built to last! The new Dams 2018 BlueBox catalogue is available now. Featuring over 1,000 products all available from stock on a next day delivery service, this 64 page catalogue has been specifically designed for ease of product navigation, making it the perfect tool for dealers to generate office furniture sales where speed is essential. BlueBox products are nett priced, inclusive of the 24 hour delivery charge, making it very easy for customers to use. The BlueBox catalogue contains over 60 seating products across all categories, and we have also added in our new Elev8² Mono height adjustable desks with a single motor which allows the user to electronically adjust the desk height from a sitting to a standing position with the touch of a button. BlueBox products are delivered directly from our extensive stock holding, all available next day and nett priced. New for 2018 is Fuze - a desk range with a solid oak leg frame and co-ordinated desktop finish options that provide a modern, stylish twist on bench desking. Fuze desks are the perfect answer for a less corporate modern office, blending the best of European design with the highest workmanship standards to span a wide range of applications and support the most creative of workspaces. Fuze is also available as a range of stylish modular meeting tables so it is perfect for matching boardroom tables with desking for the totally coordinated look. Fuze exemplifies elegance, providing a sophisticated table design which can be extended with add-on units with a recessed leg positioned in the centre of the tables. Fuze bench desks and boardroom tables sit alongside Dams best-selling ranges in the new Dams Furniture Guide 2018 which is available now. We are delighted to have been shortlisted for the European Office Product Awards (EOPA) Video of the Year award for our Dams 50th anniversary video. The aim of the video was to give our key customers a look at what is behind the brand, telling the Dams story since the company was established in 1967. The first part is narrated by Dams founder Barry Scott using old photography and historical library footage from the last 50 years. The second part of the video was to celebrate Dams in 2017 focusing on all aspects and departments of the business. This is narrated by current Dams Managing Director Chris Scott (Barry Scott’s son) and features Dams employees doing their everyday jobs across our head office site, UK manufacturing operations, distribution centre, and much more. The Video of the Year nomination rounds off a great 50th anniversary year for Dams in 2017. The new Dams Furniture Guide 2018 has just arrived - for all your workplace needs. Bigger and better than ever, the new Dams catalogue features easy-to-navigate product sections and is packed with our comprehensive portfolio of over 4,500 products which offer all the good looks and aesthetic choices to satisfy the latest trends and the most enduring designs. The 2018 Furniture Guide is available in an interactive electronic flipbook which allows for easy navigation at www.dams.com. All our product images are available to download as individual images or grouped together in a convenient zip file from the dams.com website. The Dams product data, including images, product features and marketing content, is also available via Fusion Data. Contact our team at marketing@dams.com to find out more. One of the highlights of our Social Spaces 2 portfolio is Figaro - a new lounge chair with broad appeal and strong character which is a stylish solution for office receptions and breakout work areas. The high back chair, with provocative lines and curves, is ideal for a relaxed or casual collaboration and for when people need time to unwind and recharge. Figaro is part of Dams new and improved Social Spaces product portfolio of over 45 unique product designs for breakout areas and interiors within commercial environments. The launch is supported by the publication of the second edition of the Dams Social Spaces brochure with new, innovative designs to complement the already proven and best-selling products that have been retained. We’ve recently secured the lease on a new 15,000² ft. manufacturing site – which is now our 3rd production facility located on Knowsley Industrial Park, as well as our head office being on the industrial estate. “The Brambles” has been fitted out with low-batch wood working machinery and is already fully operational to help support the increasing demand for small batch production, Social Spaces products and accommodation furniture. We’ve also recently installed a new 999kW biomass burner to use waste wood from our factory to power our central heating system, reducing our demand on oil and gas while at the same time reducing our carbon footprint. This investment in “The Brambles” and new machinery enhances Dams ongoing commitment to UK manufacturing and is part of our long-term plan to re-invest in the business to support an aggressive growth strategy. We are delighted to have won the prestigious Manufacturer of the Year Award 2017 at the Integra dealer group conference. This is the third year running that Dams have been named Manufacturer of the Year and the whole team are extremely proud that we’ve managed to get the hat trick of awards. It really is fantastic to be acknowledged by Integra members as the exemplary manufacturer in the industry. The Manufacturer of the Year award recognises Dams extensive UK manufacturing operations and the hard work of Dams employees across all departments of the business. Our customers are our number one priority, which is why we remain committed to offering excellent service, competitive products, first-rate marketing support and an extensive range of furniture solutions. The newly refurbished Dams showroom is one of the largest office furniture showrooms in the UK. Showcasing an eclectic mix of our office furniture products in their hundreds, the showroom has been designed as a sophisticated and informal space to help you find the furniture style you’re looking for. We always encourage our customers to come and visit us to see and experience our products, as this is the ideal way to introduce customers to new product ranges and gather feedback for further product and service innovations. Customers are welcome to pop into our Knowsley showroom or book an appointment with one of the Dams team. Dams celebrated our 50th anniversary in style by holding a dinner party and a night of entertainment at the Crowne Plaza hotel in Liverpool. Held on the 8th September, around 230 customers, suppliers, colleagues and friends mingled, drank champagne, were served delicious food and treated with a night to remember with entertainment including comedian Mick Miller, the Secret Singing Waiters and cabaret act The Wack Pack. The 50th party was also an opportunity to raise funds for Dams chosen charities for 2017 - Alder Hey Children’s Hospital & the British Heart Foundation. The master of ceremonies for the evening Pete Price (from Radio City) was on hand to host fun games, an auction and a raffle with some great prizes to be won, and Dams were very thankful to our generous guests who helped raise over £7,200 for the charities. Dams have launched our new and improved Social Spaces product portfolio of over 45 unique product designs, created by our in-house design team to enable total flexibility for any office or business environment. Every upholstered item in the Dams Social Spaces range is made-to-order using the customer’s choice of fabrics for a fully co-ordinated look. The launch is supported by the publication of the second edition of Dams Social Spaces brochure with new, innovative designs to complement the already proven and best-selling products that have been retained. The Social Spaces range of contemporary, design-led products includes upholstered soft seating, meeting pods, modular seating, lounge chairs, dining seating, tables and benching solutions to transform the office environment. Raising £50,000 is a huge target for Dams but we wanted to do something momentous to mark our golden year and we are all passionate about achieving this goal. It’s great that so many Dams employees are getting involved and raising money for out chosen charities for 2017 which are Alder Hey Children’s Charity and the British Heart Foundation. Employees are also invited to take up voluntary work for the chosen charities. The Dams charity committee have been very busy organising various fundraising activities and events held throughout the year including a cake bake, company raffles, a Knowsley safari park walk, charity car washes, a virtual race night with disco, a BBQ breakfast and our 7.5km expedition up Mount Snowdon - all of which are getting us closer to our £50,000 target. Record numbers of customers are now using our MyDams customer portal, which has been developed to bring all your product details, images, stock information, customised promotion flyers and sales quotes together into a single place that’s easy to manage. If you are a current Dams customer and you have not tried the MyDams online portal, you can sign up for a free account today. If you have logged in to MyDams page in the last month, you will have noticed that you now have a new, personalised dashboard page with a summary of your details and the ability to change your password. There’s visibility of your company logo and banner image, in addition to an overview of your most recent personalised flyers and sales quotes created, with quick links and handy user guides. The Dams Social spaces range has been getting extensive coverage in industry publications, including Mix Interiors, FX and OnOffice magazine, in recent months. We will also be launching a new Social Spaces catalogue in the next quarter with even more new, innovate products – so watch this space! As part of Dams’ 50 year celebrations in 2017, we are awarding a monthly bonus of a £50 voucher to thank an employee for going above & beyond the call of duty. This award is a celebration of all the good things people can do and to thank individuals who have made a difference and who have delivered more than is expected in their role at Dams. Winners of the Dams Above & Beyond award in the last quarter are Daniel Collier from the Dams Delivery & Installation Team, Lewis Stubbs from the Dams Manufacturing Team, and Dan Radoane from the Dams Upholstery Department. Well done guys. Well deserved!